Final Fantasy Tactics: The War of the Lions for Android is a turn based strategy game with role playing. The basic premise for most of the games revolves around an in-depth job system. It is a class-heavy Final Fantasy game that carefully introduces and outlines the job classes that make Final Fantasy unique. You play as a young knight who ends up in conspiracy, tragedy, and great war. In the company of fellow adventurers, you will have to battle through the land of Ivalice. 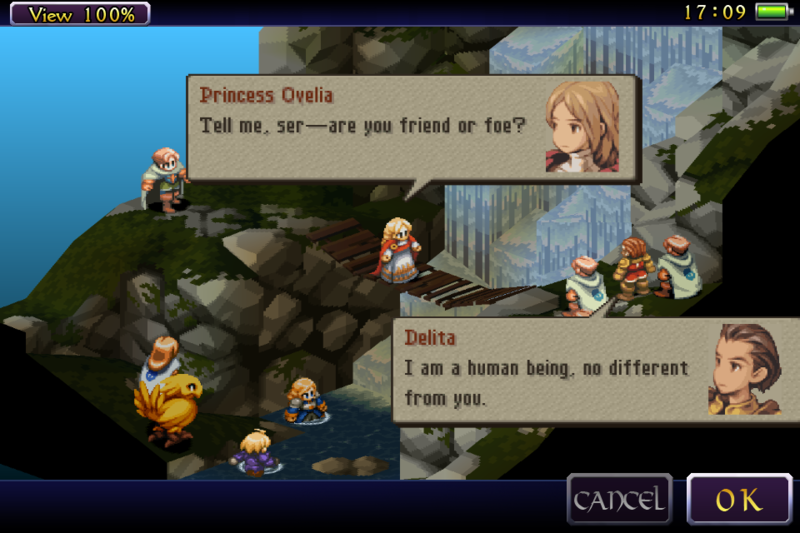 Final Fantasy Tactics – WotL for Android costs $10.99 to download from Google Play Store. Controlled by simply tapping units and menus, the complex tactical game can be effortless and intuitive. Gone are the old methods of switching fixed map views. Rotate, move and change the size of maps as you please by sliding and pinching. The touchscreen controls work really well. You are rarely swamped with commands in between the game and that does not bring down the pace of the game. Loading times have is really quick and will get you into the action quicker than ever. You can skip certain cut scenes as well. Action sequences take place on isometric 3D battlegrounds that range from cobbled village streets surrounded by buildings to barren desert plains populated by animals. The game’s protagonist has no nose and Final Fantasy Tactics character art prevails. The gameplay of Final Fantasy Tactics – WotL for Android is dotted with lovely hand-drawn landscapes that are a treat which can be compared to the movie that opened the original PlayStation game. The music is soul-stirring, and the English voice over is crystal clear that you will not search for the volume control. For fist time player, the game can be a little complex but it does include a comprehensive tutorial that you can access at any time from the menu. With a story that gave life to the world of Ivalice, you can enjoy Final Fantasy Tactics – WotL Android game whose high strategy battles bring tactical games to a whole new level. The game is a must-buy if your access to the PlayStation family of systems is limited and you are dying for a good turn-based strategy game.